Hi guys! It’s Brian, the CIR of Kizugawa. To enhance the international exchange of the three municipalities of Kansai Science City in Kyoto, Polly (Kyotanabe CIR), Jake (Seika CIR), and I hold 2 to 3 joint events together every year. And this time, we had a spring dance party. 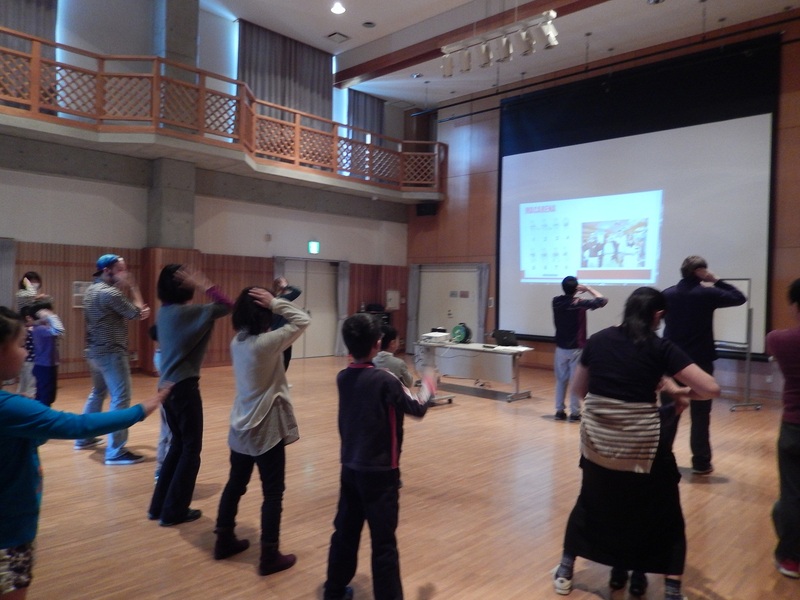 In recent years only few dance fads have made it to Japan. 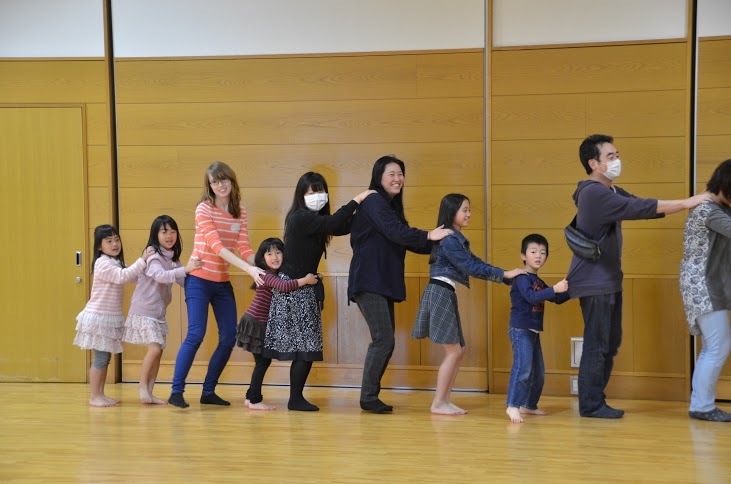 We wanted to share some of the popular dances in the US with the locals, and we asked our participants to come with their family to dance together at this event. Our Spring Dance Party took place on March 26. First we talked briefly about the dance culture in the US and the UK. There are school dances in both countries, and also people dance at weddings and other ceremonies. Then we started with the simple and old-school. We did the Macarena. It was easy so we played with the speed of the song and had all of us either rushing or in super slow-motion. The kids really liked it. Next we introduced the Cha-cha Slide. After we went through the surprise moves like the Charlie Brown and Hands-On-Your-Knees, we had a great time doing the listen-and-move (watch-and-move for us at this event) number. 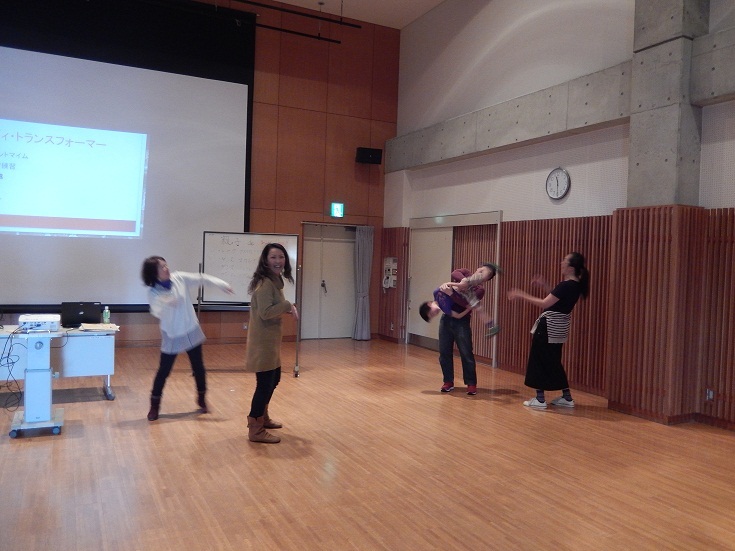 We then played Body Transformers, which is simply team charades. 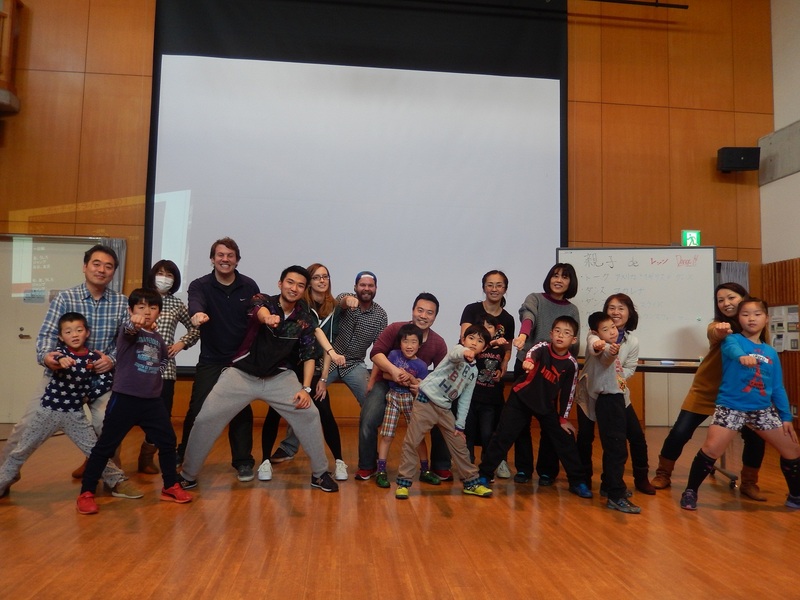 We challenged the participating families with difficult questions such as conveyor belt sushi and electric fan. We were very impressed with the creativity we saw, and had a good time joining the children in charades. We finished the event with Watch Me, the song and accompanying dance that went viral in 2015. The moves were confusing at first. After a couple of rounds, everybody was doing the whip, the nae-nae, and the stanky leg perfectly. As our last 3-municipality joint event, I had a great time. Dance is a way of expression, and has long been a tool of social exchange. Plus, it is a lot of fun! 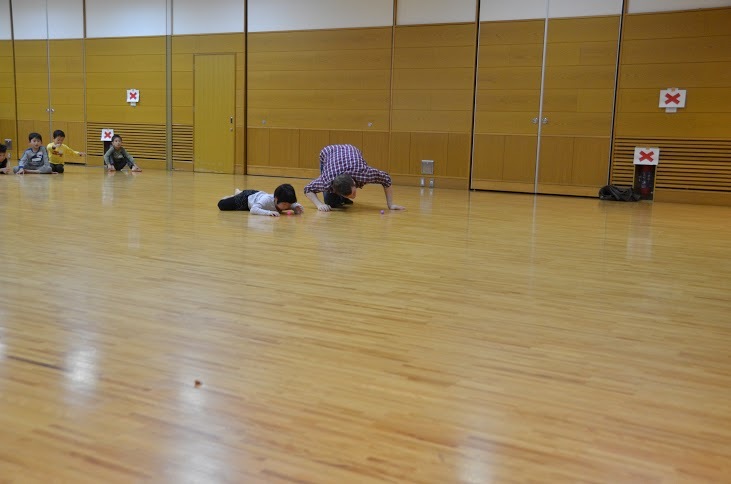 With the popularity of SNS such as Youtube and Twitter, hopefully more fun dances will emerge around the world. I hope I can see you on the dance floor someday! Hey y’all. It’s Brian from Kizugawa. On July 28th, I had my 8th “Comfortab-LEE Brian” lecture. This time I talked about the youth culture in the US. I started by introducing “what’s up?” along with other casual greetings, also the motions done along those greetings including hugs and pound hugs. I briefly touched on the rise of the hipster culture among young adults and ended with the popular internet memes related to Japan, including doge, hadokening, and meanwhile in. I had fun sharing the youth culture with my audience. It was a cross-culture, cross-generation experience. The next Comfortab-LEE BRIAN is on September 25. I will be talking about love and marriage in the US and China along with the two Chinese interns at the city hall. Hope to see you there! 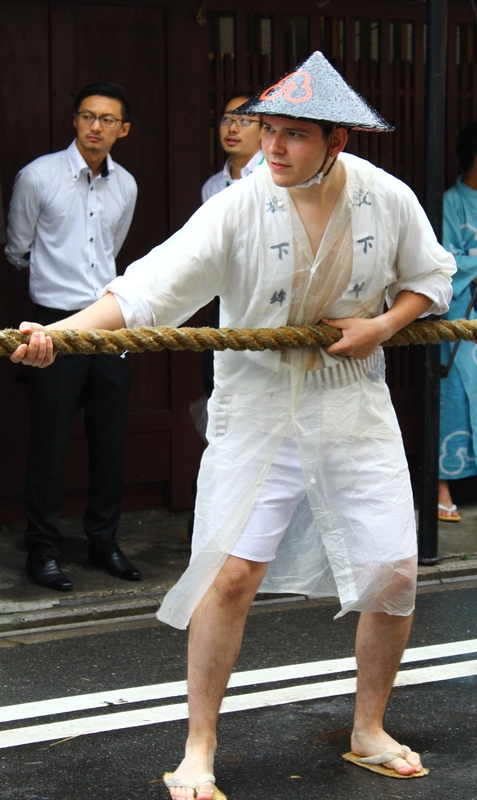 On July 17th, 4 CIRs of Kyoto Prefecture (Mark at Kyoto Prefectural Office, Jake in Seika Town, Brian in Kizugawa and Eric in Kameoka) participated in the Gion Festival and pulled one of the big float, the Houka Hoko. 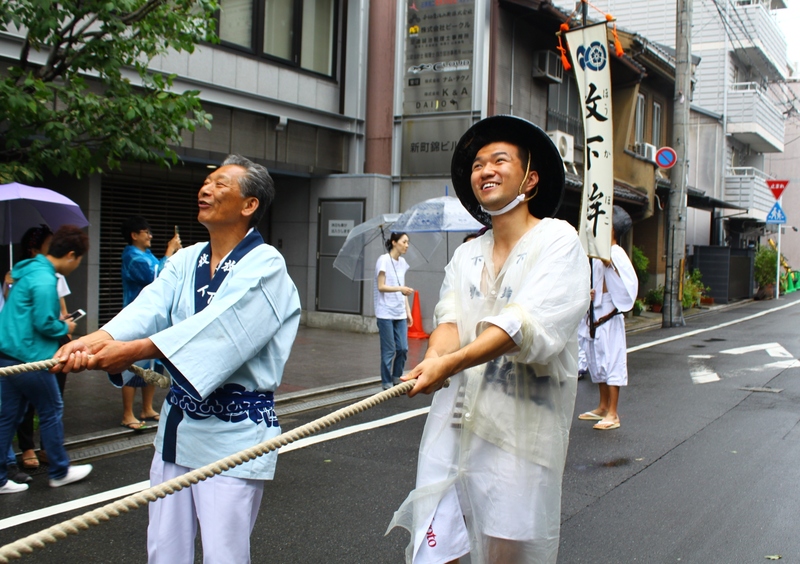 In spite of the typhoon and heavy rain, all of them had the brighest smiles during the day, and were delighted to have been able to participate in such a major festival, as well as being able to experience first-hand Japanese culture and traditions. 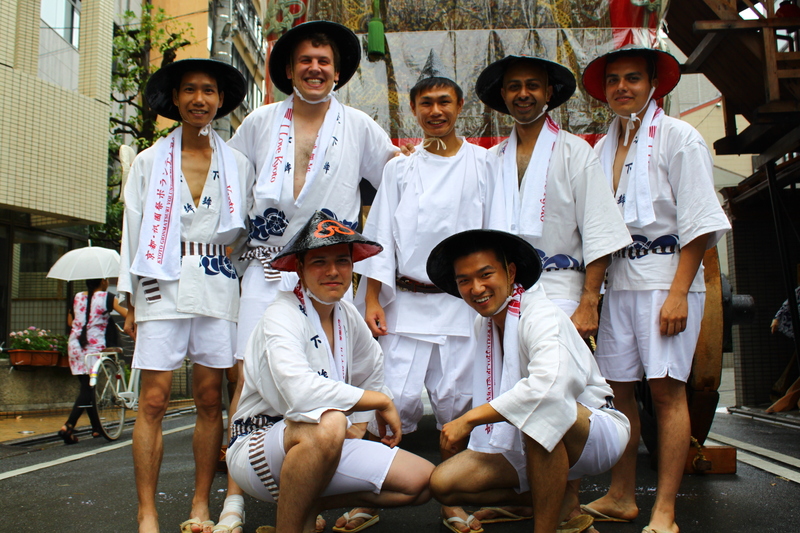 I had the pleasure, and privilege, of taking part in the first of the two parades of the Gion Festival (the saki-matsuri, 前祭) on the 17th July, along with Jake, Brian, and Eric. Although there were worries that the typhoon would scupper the plans, we all got up bright and early anyway to head over and get ready. 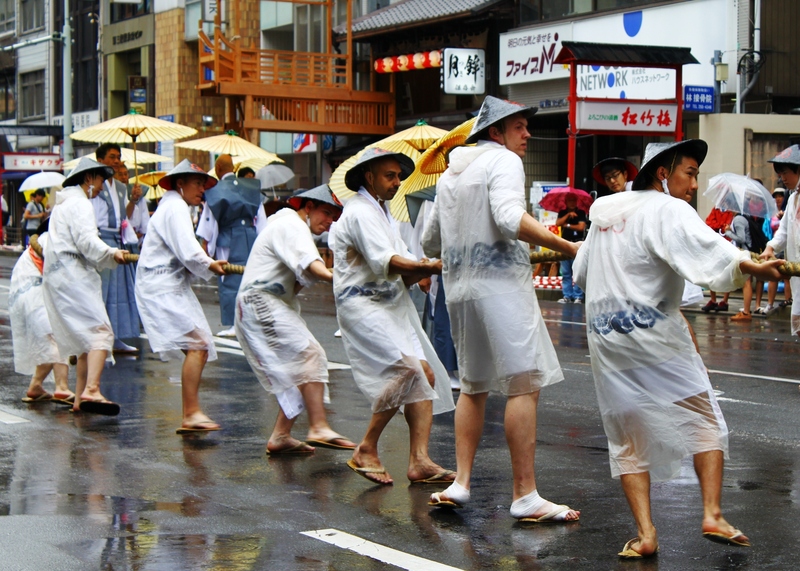 Ultimately we got the green-light to go ahead, so after getting dressed into our outfits, donning the hats, and taking pictures, we joined the 50-strong team to heave the Houkahoko through the wind and rain. I’m actually very glad for the rain as it kept us cool throughout the day, and although it was a little tough at times, I think I would have struggled more in the blazing heat of a sunny summer’s day! I had a really great time, especially along Oike-dori and Shinmachi-dori when everyone was cheering us on and shouting words of encouragement, despite the bad weather. Hearing and seeing them cheer us on really gave me the extra energy I needed towards the end to finish the day. I am also happy to have finally experienced first-hand Kyoto’s pre-eminent festival and feel more attached to the city. I’m very grateful to KPIC for organising it, and perhaps we can take part again next year! Gion Masturi was a lot of fun! 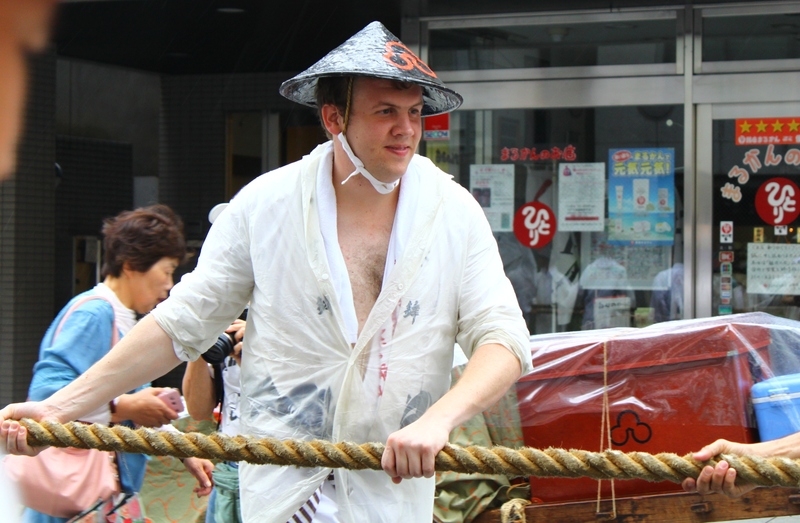 The Hoko cart was surprisingly heavy though, so I am happy it rained. If I had to pull it when it was sunny out, it would have been really tough. It was also nice to see all the spectators cheering us on. Thanks to them pulling the Hoko didn’t feel so tiring. 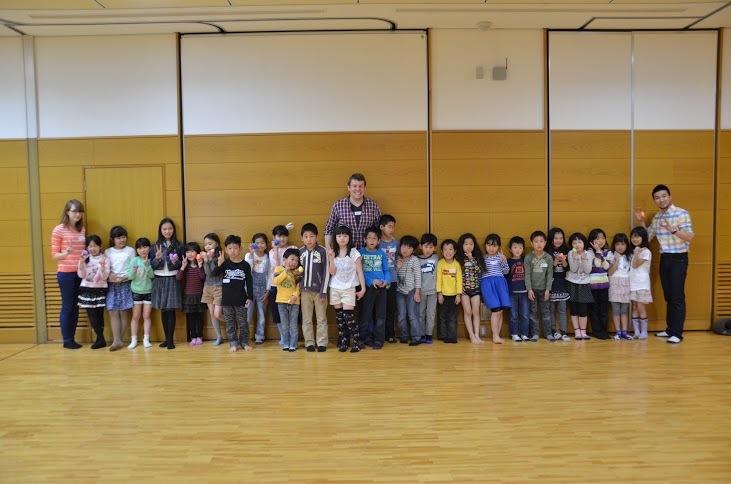 I think it was a good experience and I would love to be able to do it again if I have the chance. 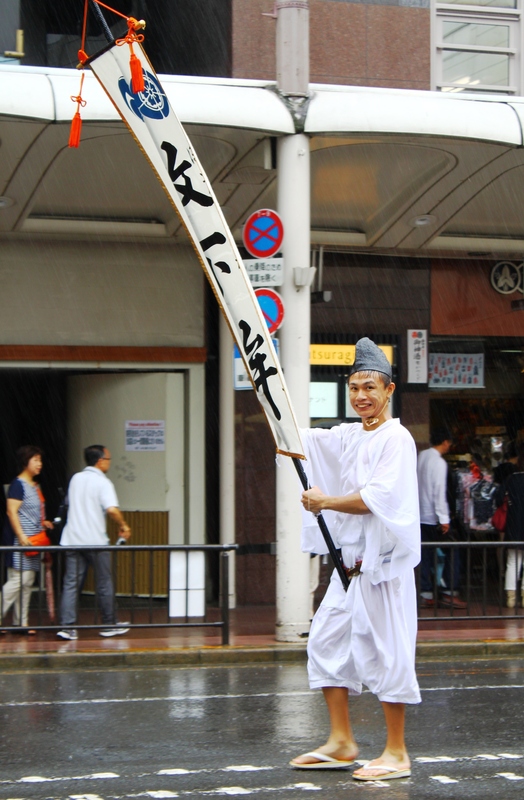 It was an honor to participate in Gion Festival, one of the three representative festivals of Japan. 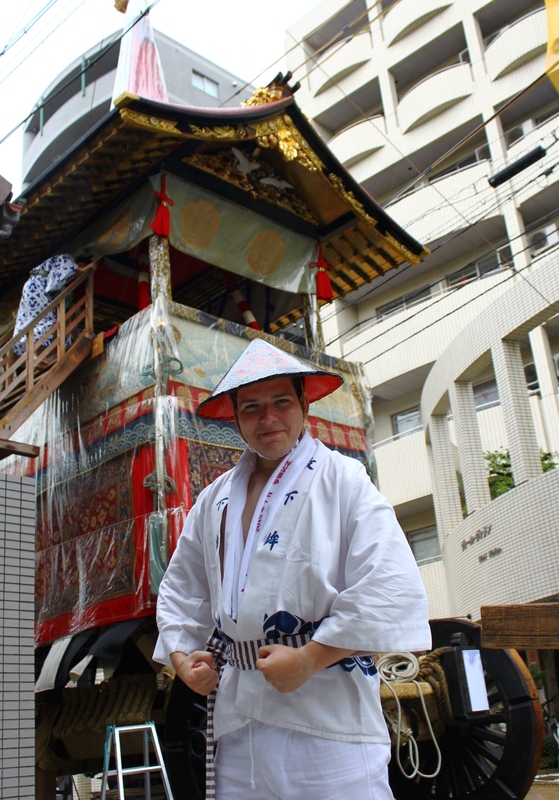 I have been to the Gion Festival while I was studying abroad in Kyoto, but never have I imagined myself actually being a part of the festival and pulling the floats. 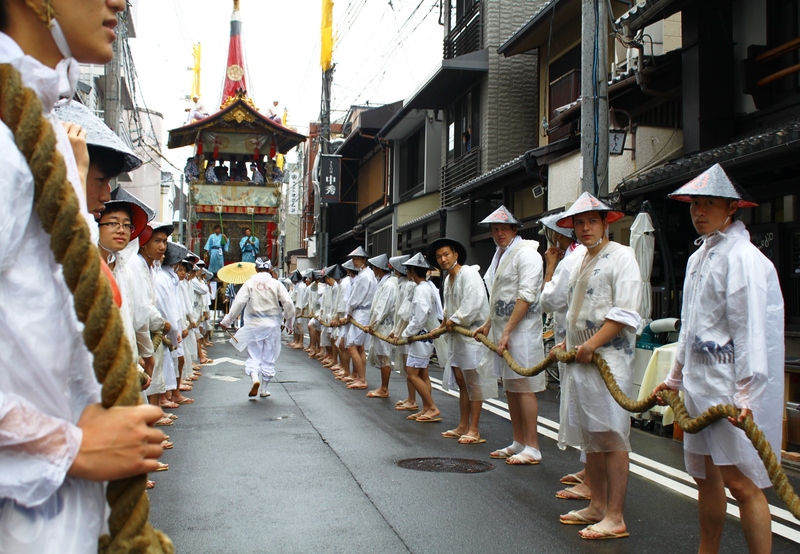 The volunteers, the locals, the visitors, the community came together for the millennium-old tradition. Although we were all soaked by the downpour, it didn’t take away our passion. It was a great experience. 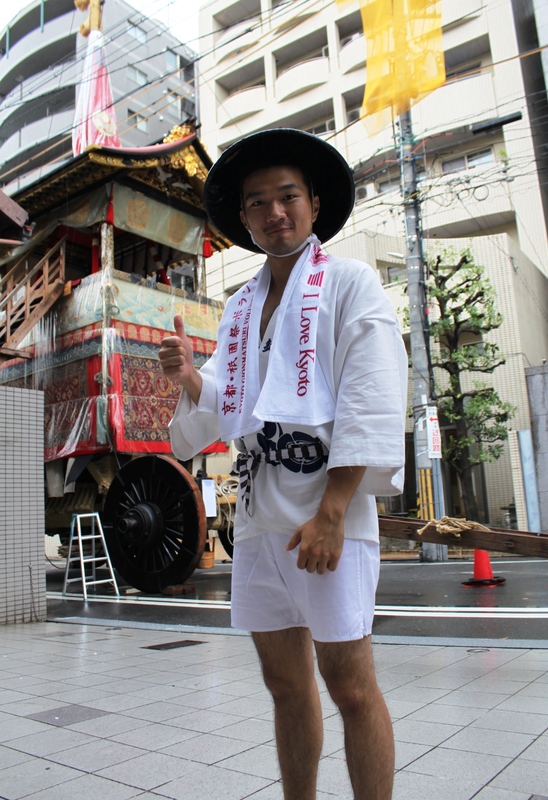 Eric (Kameoka CIR) was the flag holder for the float! Hey it’s Brian from Kizugawa. I had my 6th Comfortab-LEE Brian lecture on March 26th. To wrap up the fiscal year, I had a lecture on the major holidays in the US and Taiwan. In the spirit of April Fools’ Day, I pretended to end my lecture after my self-introduction, giving them a preview of the next lecture. The audience had a good laugh out of it. To decide which holidays to cover, I prepared a holiday bingo sheet for the audience to play. From the well-celebrated Christmas to the less-known Easter, I covered the representing holidays of each season. I had the most fun introducing Saint Patrick’s Day, which none of the participants were familiar with. We had too much fun talking about the different holidays so there were still many left at the end of the lecture. I think I will have a part two for this subject as well! Join us at the next Comfortab-LEE Brian, which is on May 28th. I will be talking about movies and TV shows in the US and Taiwan. Hope to see you there! 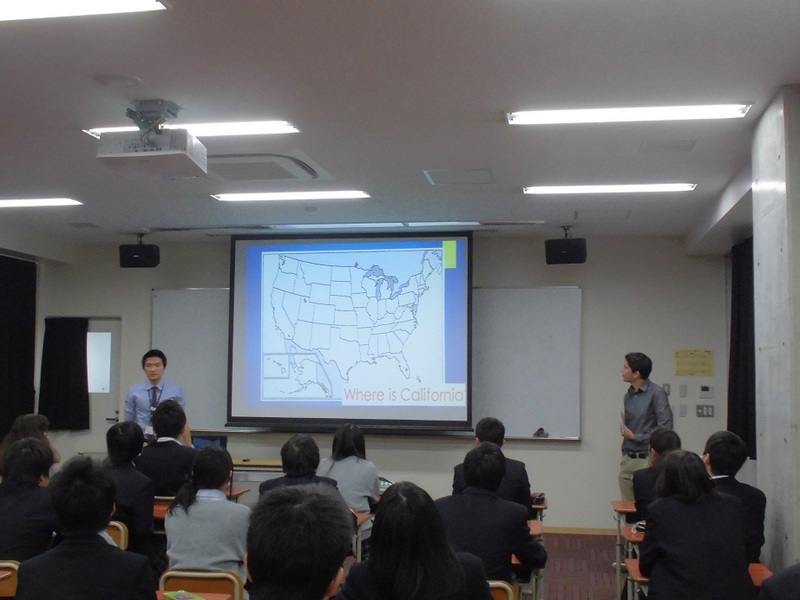 On November 13th and 14th, I visited Kizu Minami Junior High School. I had an international understanding lecture with Juan Carlos, the AET of the school. 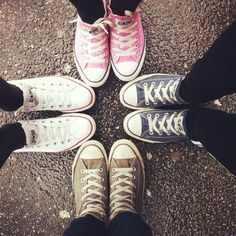 From the American school year system, school culture, greetings of young people, to abbreviations for texting, I gave a brief introduction to the teenage pop culture. 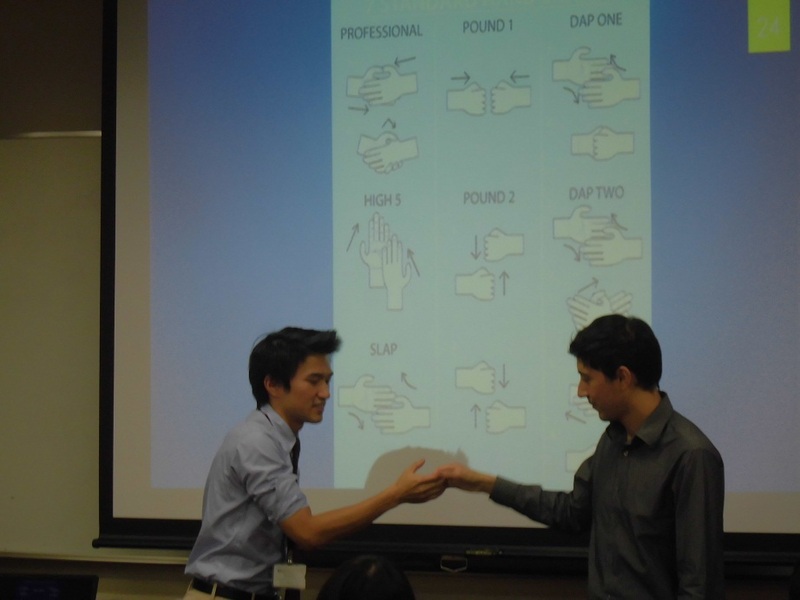 In a light-hearted atmosphere, the students reacted to my jokes, and we had student volunteers demonstrate some American style greetings with us. It was a lot of fun. I hope I will have more opportunities to do events like this.